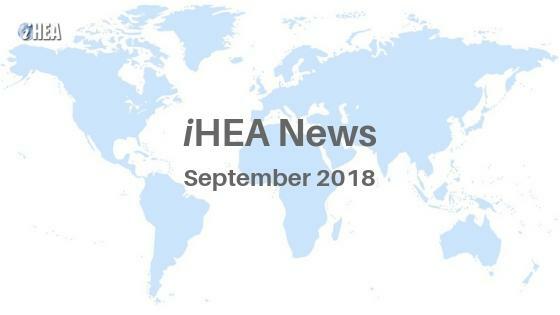 A priority activity over the last few months has been designing a web-based repository of training materials, which is an initiative of iHEA's Teaching Health Economics Special Interest Group (THE SIG - see update on THE SIG update activities later in this newsletter). The aim is to provide an integrated, centralized repository where health economics teachers from around the world can locate material to enhance the delivery of their teaching programs. We are pleased to announce that the repository is now publicly available. We encourage you to explore the material already uploaded, and also to consider contributing materials to the repository on a Creative Commons basis to make this a truly international resource. Are you Making use of Opportunities to Network with Fellow iHEA Members? Whenever we engage with members about the priority activities for iHEA to undertake, the highest priority other than hosting the biennial congress is to facilitate networking among health economists with shared research, teaching and/or policy interests (see for example the 2018 Member Survey). Over the past year, several initiatives have been launched to provide networking opportunities which we like to encourage members to use. Seven SIGs have been established specifically to provide platforms for professional interaction between iHEA members with common interests. These SIGs are becoming more and more active, organizing webinars and encouraging engagement between members through discussion forums. Why not find out more about these SIGs on our website and join one or more of them. ...or Find Colleagues to Connect With on SocialLink! You can either use SocialLink via the downloadable app (apple | android) or simply by logging in to your member account on the iHEA website. It is very easy to search the iHEA member directory by typing in a keyword (e.g. "pharmaceutical" in the screenshot below) and all members who undertake research in this area will be listed. You can view their information (e.g. institution, location, other research interests, ORCID iD, webpage, etc.) and can send them a message. Why not use SocialLink to find colleagues to work with on an organized session proposal for the 2019 iHEA Congress or to explore collaborating on a research project? You can learn more about using SocialLink online here! We hope to see many of you in Basel for the 2019 iHEA World Congress and encourage you to submit an abstract for consideration by the Scientific Committee! We particularly encourage the submission of organized sessions in the form of presentation or panel sessions. There is more information on abstract submissions available online here. It has been a busy last few months for our SIG, some of which has involved 'behind the scenes' planning by the SIG conveners for more active engagement with all SIG members. SIG members Maia Platt, Allen Goodman and Jill Boylston Herndon organized and facilitated a workshop on teaching health economics at the 7th Annual Conference of the American Health Economics Association in early June. More details on this session can be found in the June iHEA newsletter. We have been particularly busy developing an international repository of health economics teaching material. This will be a global resource of sharing materials and best practice to promote and encourage the training of the next generations of health economists. More information on the rationale behind the creation of this repository can be found here: Frew et al. (2018). Building an international health economics teaching network. Health Economics 27: 919-922. The focus of activities to date have been to design the repository webpages and to load materials that were compiled by the UK Health Economics education (HEe) initiative. We are indebted to Emma Frew, Nancy Devlin and Heather Brown who were involved in establishing and developing the HEe resources and who supported their integration into the new international repository. We are now actively seeking additional materials to share through the repository to expand the range and number of resources available. We will keep you updated on progress of the repository and hope that you will all find it useful and contribute material! We also want to draw your attention to a forum posted on the THE SIG SocialLink group forum by Maia Platt (accessible to signed-in iHEA members only). We would like to know your views on a potential organized session, for the 2019 iHEA Congress in Basel, on teaching health economics to health care professionals and how to engage this important group with health economics. Keeping on the theme of the next iHEA congress in Basel, teaching health economics is now officially included in the list of health economics fields. Organized session proposals are encouraged to the broad field of "New Developments in Methodology". Individual abstracts are encouraged for the Special Invited Session (SIS) “Addressing the Health Economics Capacity Shortfall Through Quality Health Economics Teaching”. We hope to see some of your work on the innovative teaching that is going on in health economics presented at the Congress! We are also planning a half-day pre-congress session for the 2019 Congress, with a focus on workshopping ways to promote active learning in health economics courses. Finally, we would love for you to join our SIG, if this newsletter item has peaked your interest! The second interview of this series is with Giulia Ferrari. Giulia is a Research Fellow at the London School of Hygiene and Tropical Medicine. Prior to this appointment, Giulia completed her PhD in International Development at the London School of Economics and Political Science. Giulia has more than ten years of experience in socio-economic research on violence in sub-Saharan Africa and the UK, and has worked as a consultant in the international and sustainable development fields. Angela Esi Micah and James Buchanan, two of the conveners of the ECR-SIG, spoke to Giulia in September 2018 to discuss the importance of the doctoral research environment, the advantages and disadvantages of part-time PhDs, and her research on gender-based violence in lower and middle income countries. To read the full interview on the ECR SIG webpage click here. Thank you to all who Attended our First Webinar, Presented by the ECR SIG! Our first webinar Bridging the Gap Between Research and Policy for Early Career Researchers in Health Economics, hosted by the ECR SIG, was held on Friday, September 21. The slides and recording from this webinar are now available online here! Information on any upcoming webinars can also be found on this page. iHEA Members don't forget to login and use SocialLink, our new social networking web application and mobile app! Click here for more information.